The Keeper of Realms for free! + Get notification about our upcoming Kickstarter project! with adventure hooks for Game Masters. Once there was a library, protected by a small group of wizards. They called themselves The Keepers of the Realms and they hid their secret from the eyes of the word. Emperors, kings and adventurers were not be able to get close to them; The Keepers knew their secret would be devastating in wrong hands. But, one day an initiation ritual went wrong and their monastery met its end. The Keepers vanished from the Earth. Only the ruins remember them. The Library is still hiding those black leather scrolls they protected for thousands of years. What was contained in them? Why were they so important for The Keepers? It’s up to your team to figure it out! can use and bend to their own story. Extra realistic and scenic 3D based graphics which makes your adventure more thrilling. If you are the type who likes the wonderful and breathtaking visual worlds of movies and games, then you can relive them on your gaming nights sitting around a table in your home (or online) with your friends. 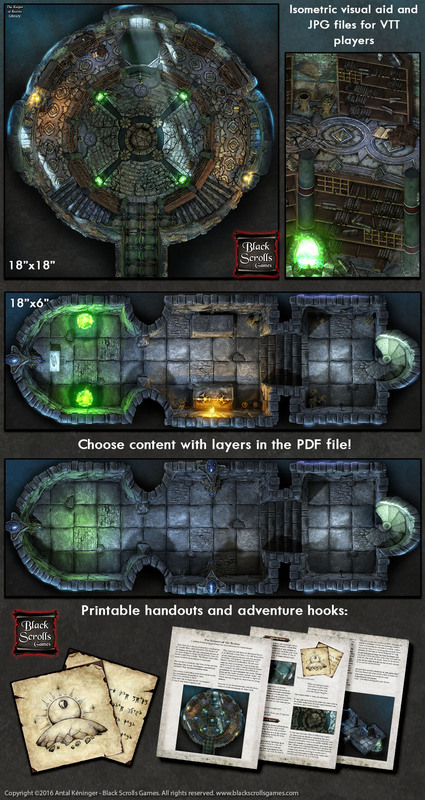 Isometric visual aid: you will get the isometric version of the map that you can show your players or use as a handout in your adventure. It makes the area descriptions easier and provides the players with more immersion. 1. The first thing I do is draw sketches for the map and figure out what 3D models I need to make it real. 2, I sculpt them in Pixologic Zbrush. Every model that you can see in the maps is modeled and textured by me. I don’t use models form other artists or free ones from the internet. Zbrush is a professional modeler program used by many studios like Industrial Light and Magic (Pirates of the Caribbean, Jurassic World), Weta Digital (The Hobbit) and many game studios. It allows me to make my models really detailed and realistic. 4. I set up the lights to get the best results (not too dark, not too realistic for the fantasy setting and achieve the style I like working with). I set up the materials, make some test renders and add a lot of additional detail to the final version in Photoshop. 5. I write the background stories with the help of writers, proofreaders and of course, my friends. You can also help us if you feel the urge. Join us on the next link: BSG Forum. This way you will be among the firsts who get the BSG maps in exchange for your help. 6. Finally, I assemble the PDF file, set up the files for print and release them for you. This is the process for how the maps are created. I hope you will also enjoy them, at least as much as I enjoyed working on them! Thank you for downloading my product! Who can I send this map to? you will be able to download this product on the final 'Thank You' page and from the e-mail I send you. This subscription is needed me to send you files. I will not send you spam and you can unsubscribe anytime, but if you stay on my list you will get excusive inner info, sneak peeks of new maps and coupons for my products, even for the printed ones. There are currently more than 700 gamers on this list.